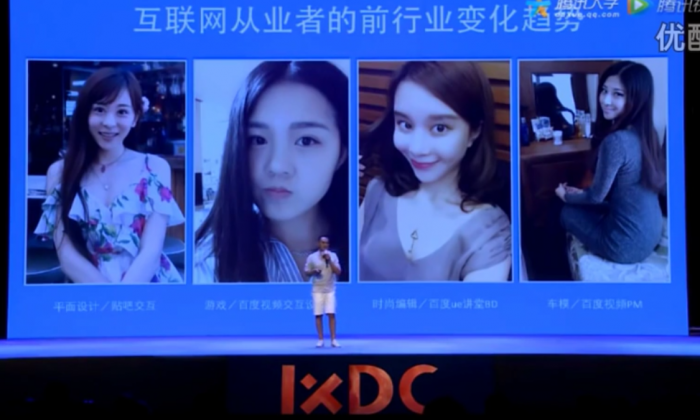 Liu Chao, the director of user experience at Baidu, China’s largest search engine, seemed to think that his remarks about the appearance of female colleagues were quite clever, at a conference recently. This was the last straw for the audience, a largely educated and urban set that is increasingly conscious of discrimination and objectification of women. He was jeered and booed, and the live broadcast was temporarily cut as Liu dealt with the appalled audience members. “You’re too low, get off the stage,” one audience member could be heard calling out. At another point in his talk he attacked a Chinese phone producer, and made sexual references. Audience members later described parts of the presentation “off topic,” crude, and self-promotional, in posts online. On July 4, Liu posted an apology on Baidu’s intranet, acknowledging the negative effect that his “lack of emphasis on self-importance, problems in use of speech, and inappropriate attire” brought the company and staff. Baidu staff responded to Liu’s apology with more anger, according to screenshots of comments posted to the public internet. Complaints piled up again questioning his professionalism, work ethic, and even the attitude of his apology. Some urged him to resign. “For the sake of every Baidu worker who has endured mockery on social media… please don’t apologize, please leave Baidu,” one staff member wrote, explaining that she’d just spent a weekend being ridiculed by friends. Liu’s display seemed to further entrench the negative feelings toward the company among the public. Baidu is the largest search engine in China, a position which is widely seen as having been granted by the authorities, and yet many in China believe it has abused this position of trust and power. Earlier this year it was embroiled in a scandal of providing advertising for hospitals peddling scam medical treatments. “The company has become a joke in the industry,” one user wrote. “You stabbed the final knife into Baidu’s public image, which has already sunk to the bottom during the first half of the year,” said a staff member from Baidu’s film department. Liu Chao will be relieved from managerial position, Baidu said in a company intranet follow-up post, though he has not been fired.